Many people know that city-processed water, commonly known as tap water, is considered safe to drink. However, many people don’t know that tap water is full of chemicals such as chlorine, visible sediment, Fluosilicic Acid (Chemical version of Fluoride from Aluminum Waste, and pharmaceutical waste. When presented with these facts, many become scared to drink tap water, but there is a process to remove it, and that is by a reverse osmosis. A reverse osmosis system is able to purify the tap water to remove 99% of harmful material. The Everest Alkaline Filter works in conjunction with the reverse osmosis system to restore minerals removed by the purification process. Many people are aware of alkaline ionizing machines, but these do not purify the water, they just simply filter the water to remove chlorine and not much else. It is important to not only drink alkaline water, but to also make sure that it does not possess chemicals and other harmful byproducts that appear in non-purified water. The human body has a blood pH of 7.365 and it is essential to maintain this pH balance. Much of what we eat, such as meat, dairy, and processed food have an acidic effect on the pH balance. The body has to work extra hard to restore itself to a neutral pH. The Everest Alkaline Filter greatly assists in the balancing process by introducing a higher pH to the body to offset the acidic condition and therefore, the natural balance is reestablished, producing high pH alkaline water. The Everest Alkaline Filter has other benefits beyond increasing the pH of purified water. The oxidation-reduction potential (ORP) is one of the most important benefits of alkaline water. The ORP reading is an indicator of how bio-available and bio-absorbable a product will be in your body. The lower the reading below 0 millivolts (mv), the more mineral ions are available to assist with your body's metabolic functions. A high negative ORP is desirable because it is very useful at neutralizing free radicals that are present in the air we breathe and food we eat. A high negative ORP triggers a natural detoxification and antioxidant reaction in the body by replenishing cellular oxygen and pushing out toxins. Most of the liquids people consume have a positive ORP, which can be damaging to the body, by the process of oxidation. The Everest Alkaline Filter can drop the ORP of purified water up to -800mv. This is why drinking Everest Alkaline water can produce positive effects on our bodies. The ORP of the Everest Alkaline Water Filter is up to -800mv. 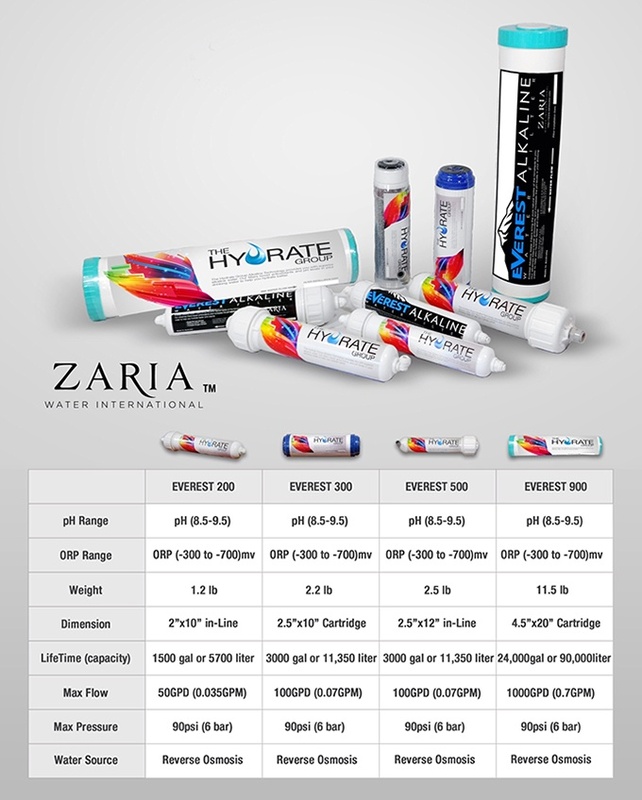 The ORP of tap water and purified reverse osmosis water is +300mv. The ORP of carbonated drinks is +500mv. The Everest Alkaline Filter utilizes tourmaline ceramic, which, when combined with water, generates indispensable minerals for the body and revitalizes the water by emitting far-infrared rays. Far-infrared rays are known for their powerful healing and detoxifying effects on living organisms by suppressing the growth of excessive free radicals and shortening the cluster chain of water. The Everest Alkaline Filter has the ability, through its carefully calculated blend of tourmaline ceramic, to produce far-infrared rays, which have been proven to increase blood circulation and produce living alkaline water. The Everest Alkaline Filter, through its emission of far-infrared rays, is able to shorten the cluster chain of the water molecule. Smaller water clusters are more efficient at protecting cells from various toxic influences. In addition, with a shorter cluster chain, the body is able to significantly increase the absorption of minerals because of its high oxygen content. This is important because, if the body does not have enough minerals, such as calcium, magnesium, and potassium, it tries to find them elsewhere and could potentially absorb the minerals from the body’s large bones and organs which could be harmful long-term. The Everest Alkaline Filter shrinks the water molecule, which enables the positive effects to materialize much sooner and with greater results. Drinking alkaline water from the Everest Alkaline Filter is the best way to induce the positive effects of smaller water clusters. We have the Everest Alkaline Filter available to produce alkaline water for many different applications, from residential to commercial. We can provide the best solution for your needs. This wonder of nature has been around since the beginning of time as it flows through the natural purifying filters and mineral rich rocks. The Himalayan water is insulated from any external influences by dense layer of protective clay. It flows for several years and it finally emerges in the form of springs at a height of 2700 meters to 3,000 meters in the Langtang National Park within the protected conservation areas and has strictly controlled access and therefore, is free from environmental pollutants. After experiencing the pristine waters of the Himalayas we were committed to creating a drinking water system that would clean and purify city water, add back trace minerals such as Calcium, Potassium and Magnesium and would raise the PH, lower the ORP, Energize, Enliven, and soften the water to give it the taste and feel that one would experience drinking from a mountain stream. Once you taste the difference you will be convinced. The Everest Alkaline Drinking water system produces the finest water on the planet.